It wants Lutsenko dismissed and pressure on the NABU to stop. A motor rally organized by members of the Automaydan movement and public activists visited the village of Stoyanka outside Kyiv, where Prosecutor-General Yuriy Lutsenko's house is located. One of the organisers of the rally was Vitaliy Shabunin's Centre for Corruption Prevention. 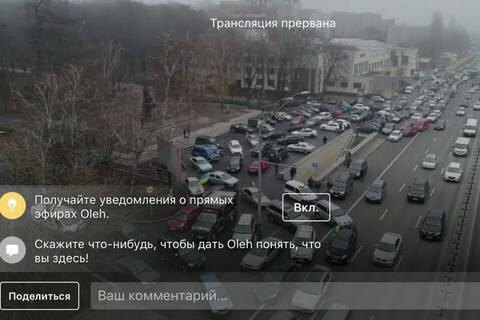 According to Automaidan leader Oleksiy Hrytsenko, over 200 cars joined the cavalcade. Participants in the rally demanded Lutsenko's dismissal and an end to the pressure they believe is being put on the National Anticorruption Bureau of Ukraine (NABU). They brought along a chequered blanket, which became a symbol of corruption after the detention of State Fiscal Service chief Roman Nasirov. Lutsenko said on Facebook that he was not home when the cavalcade arrived because he was at work "chairing a meeting on settling difficult problems of exchanging our prisoners of war". He said he did not mind criticism against him and did "not need a chequered blanket" because he was doing his work "honestly". He insisted that the NABU had committed "blatant violations". He said that Ukraine needs the NABU but it must work in accordance with the law.